Stenographer, Sangrah Amin, Assistant Store Keeper. Eligible individuals with essential qualifications are require to submit application forms for this UKSSSC Junior Assistant and other jobs by using the UKSSSC official website www.sssc.uk.gov.in. Online registration of applications starting date is 17-10-2017. Application registrations closed on 16-11-2017. Total no of vacancies available in UKSSSC recruitment notification are 179 posts. 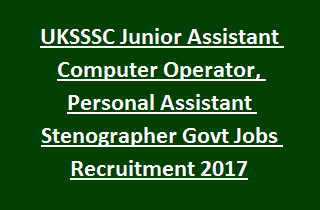 Selection of candidates for this UKSSSC Junior Assistant Jobs will be based on marks obtained in written exam. Age of the candidates for all posts is 18/21 years to 42 years as on 01-07-2017. Other age relaxations admissible as per Uttarakhand Govt rules. Application fee for general/ OBC candidates is Rs. 300/- and for SC/ ST/ PWD candidates is Rs. 150/-. Application fee payment last date is 16-11-2017. For more details of selection process, Application fee, Application procedure, Educational Qualifications, Age details regarding Uttarakhand Subordinate service Selection Commission UKSSSC Recruitment Exam of Junior Assistant, Personal Assistant Jobs are given below. There are total 179 posts available in Uttarakhand Subordinate Service Selection Commission UKSSSC Recruitment 2017. Total no of vacancies: 179 posts. 1. Junior Assistant/ Computer Operator: 96 posts. 2. Sangrah Amin: 02 posts. 3. Personal Assistant/ Stenographer: 69 posts. 4. Assistant Store Keeper: 12 posts. Candidate must have passed Intermediate or equivalent qualification with the typing speed of 4000 key depressions per hour. Please check the UKSSSC notification for other qualification details. Check the UKSSSC notification for pay scale details. Age of the candidate for all posts is 18 years to 42 years/ 21 years to 42 years as on 01-07-2017. Age will be relaxed as per UKSSSC govt rules. UKSSSC recruitment selection is based on candidate performance in written exam. For Application fee payment details, see the notification. Interested candidates may apply for UKSSSC Recruitment vacancies using the official website www.sssc.uk.gov.in. Log on to the official website and click on the selected post. Fill the application and submit the application before 16-11-2017. Online registration of applications starts from 17-10-2017.